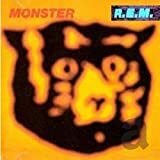 Home > Music Reviews > Monster - R.E.M. As my R.E.M. buddy Cira says, "this album was meant to be played live, not in the studio." When you really think about it, this is absolutely true. After releasing their BIG album, "Automatic For The People," R.E.M. did something no one expected, releasing a rock record which sounds little to nothing like "Automatic." Of course, this caused a lot of people to put the record down, but if you sit back and actually listen to the record, it is, in some ways, far better than "Automatic." There were numerous hits off this record, including the fan favourite, "What's The Frequency, Kenneth?," "Crush With Eyeliner," "Star 69," "Strange Currencies," "Tongue," and "Bang And Blame." In my opinion, "What's The Frequency, Kenneth?" and "Crush With Eyeliner," two of the biggest hits, are the two worst songs on the record. The greatest songs are, as usual, not the hits. "King Of Comedy" and "I Don't Sleep, I Dream" are my personal favourites, but as I've come to see, every person has a different favourite song on this record. Cira, for instance, loves "Let Me In." There must be something about "What's The Frequency, Kenneth?" that I never understood, cos that's the one everybody knows, and I just don't like one bit of it. One other song worth mentioning is "Bang And Blame." This song is completely different from any other R.E.M. song to date, and it one of the best they've ever done, in my opinion. I have always felt that on their recently released, "In Time: Best Of R.E.M.," this song should have appeared somewhere late in the tracklistings, but what can you do? All I have to say about this record is buy it, cos it's definitely worth the money.